The 2018 programme for the 6th Richard Harris International Film Festival, which runs from October 25th – 29th in Limerick, has been announced. With this year’s theme harking back to the golden era of Hollywood, RHIFF has selected Brian Reddin’s ‘Constance Smith – Hollywood’ to open the festival and will be followed by a 1950s themed gala. The opening night gala will see Reddin’s film screening in the Millenium Theatre and in keeping with the Hollywood nature of the film, there will be classic cars and characters in 1950’s Hollywood glamour attending the event. Crew and contributors will be in attendance and the screening will be followed by a Q&A conducted by Gerry Stembridge. 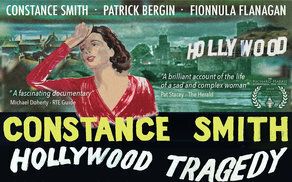 The film looks at the troubled life of Limerick born actress Constance Smith who was an Irish actress who had it all. She was the muse of legendary producer Darryl F. Zanuck, the wife of a celebrated actor and director, a co-star in Hollywood movies - Jack Palance called her the ‘Dublin Dietrich’. She was hailed as the next Grace Kelly and could have been one of the biggest stars in the world. The only thing that stood in her way was herself. The 2018 programme was announced at a duel launch in Limerick & Dublin on Thursday, which followed on from earlier launches at Shannon Airport and the Irish Consulate, New York, as this year the festival is part of the Global Irish Festival Series. Festival highlights of the 2018 programme include ‘The Brothers’ Warner’, which is directed by Cass Warner - the granddaughter of Harry Warner and daughter of legendary director and producer Milton Sperling. Warner will introduce her documentary about the founding of the Warner Brothers’ studio on Saturday, October 27th. Other highlights include the live script read of a feature in development by De Warrenne Pictures on Sunday the 28th of October and an acting masterclass with IFTA Winner – John Connors on Saturday 27th. The Limerick to Hollywood Memorabilia – Richard Harris & Constance Smith will take place on The Glazed Street of LCCC Buildings from 19th October and runs through November. Further memorabilia will be on display in the Gallery space of the Belltable and the foyer of LIT over the weekend of the festival. ‘Wrestling Ernest Hemingway’ – the Richard Harris Retrospective will close-out the feature screenings, prior the live-streamed, red-carpet awards night in LIT and closing gala party at the Savoy Hotel. The circus-themed black-tie awards night will feature live music and dance numbers. The feature films selected include the international premiere of Juliette Lewis’s new film ‘Anthem of a Teenage Prophet’ based on Joanne Proulx’s novel, the Irish & UK premiere of ‘The Stolen Princess’ from Ukraine; the World premiere of Darrell Roodt’s ‘The Furnace’ and Paul Bushe’s and Brian O’Neill’s Killers’ within and from Australia ‘The Pretend One’. Also, screening is Ronan Tynan’s searing documentary ‘Syria: The Impossible Revolution’ followed by a Q&A on the Syrian conflict. The festival also boasts a very strong shorts programme this year, with shorts from the US, the UK, Slovenia, Iran, Spain, Mexico, France and the Netherlands among the selection eligible for awards. Between Shorts and features, the festival will screen over 130 films this year. Producers’ panels, networking events, Acting workshops and VR/AR workshops will take place over the course of the festival from the 25th to the 29th of October in various locations in Limerick City. Click here for more information about festival details and tickets.